You may be surprised at the scope of this week’s topic because when it comes to Elvis Presley, well nearly everyone’s got an opinion. The iconic nature of Elvis Presley in music and popular culture, has often made him a subject of, or a benchmark, in numerous songs. We launched the show with CALLING ELVIS by Dire Straits. Written by Mark Knopler and released in 1991, the song is about an Elvis fan that can’t believe that Elvis Presley is dead. Based on some of the bizarre ‘sightings’ over the years, I fear he is not alone. A song from one of my favourite films followed: Public Enemy’s groundbreaking FIGHT THE POWER from the soundtrack of DO THE RIGHT THING, directed by Spike Lee in 1989. Like the film, the song broke at a crucial period in America’s struggle with race. Unabashedly political, FIGHT THE POWER was confrontational in the way that great rock has always been. It attacks a whole roster of American icons including Elvis and John Wayne in what amounts to a virtual flag burning. Because who better embodies the American ideal than the King? The song goes so far as to call Elvis racist. I don’t agree with that. 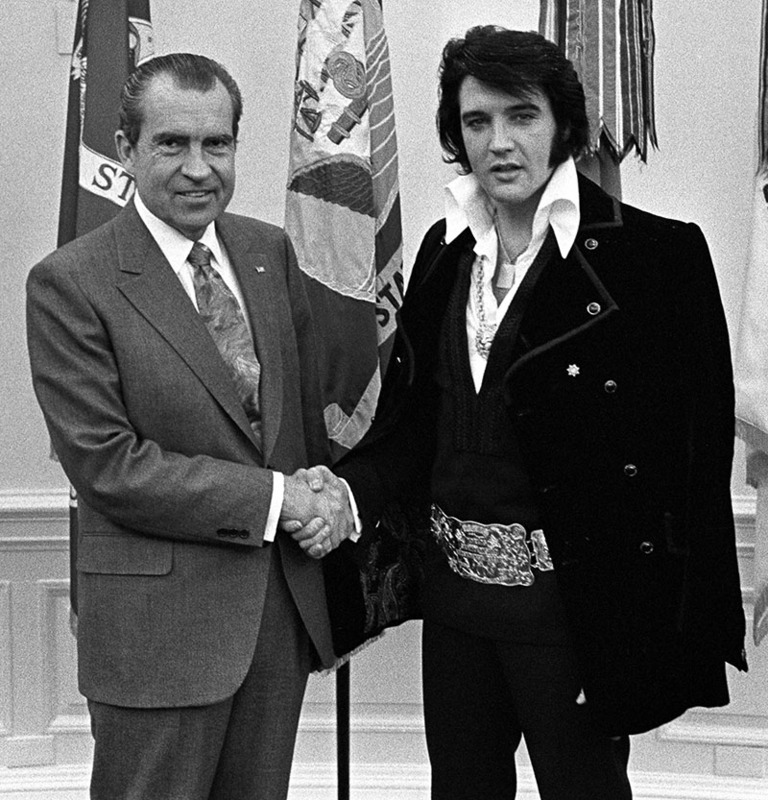 But what I do know from the National Archives is that in 1970 Elvis wrote a six-page letter to Richard Nixon asking him to make him a ‘Federal Agent-At-Large’ in the Bureau of Narcotics and Dangerous Drugs. And amongst the gifts that Elvis presented to the then President was a Colt-45 pistol. So what do we make of all this? Maybe only that, like a lot of his countrymen, Elvis was a misguided patriot who defended the nation’s order – an order from which blacks, in particular, had been routinely barred. The irony, of course, is that Elvis was the first artist to successfully blend black and white music: country music and the blues. And didn’t he do it well? It was time for a change of tone: The very whimsical and wonderful Kirsty McColl with THERE’S A GUY WORKS DOWN THE CHIP SHOP SWEARS HE’S ELVIS. The song made an appearance on the FAMOUS PEOPLE show, but definitely deserved another spin. We followed with Richard Thompson’s FROM GALWAY TO GRACELAND. Robbie Williams’ ADVERTISING SPACE is a song not only about Elvis but, also, about the price of fame. Emmylou Harris followed with BOY FROM TUPELO. In case you weren’t aware Elvis was born in Tupelo Mississipi on January 8, 1935. And then it was the great Roy Orbison with HOUND DOG MAN. Living Colour funked it up with their critique of the tabloids. The song ELVIS IS DEAD ups the ante with an appearance by Little Richard. Check it out. We dived into the second hour of the program with Ann Margret singing the title song of the film BYE BYE BIRDIE. Based on the stage musical of the same name, the story was inspired by Elvis Presley being drafted into the US Army in 1957. Jesse Pearson played the role of teen idol Conrad Birdie, whose character’s name is a wordplay on another singer of the era, Conway Twitty. The film is credited with making Ann-Margret a superstar during the mid-1960s, leading to her appearing with Elvis Presley in Viva Las Vegas in 1964. A couple of great songs were suggested to me by BayFM’s very own Cowboy Sweetheart, Carrie D. First up, Bap Kennedy with GLADYS & VERNON about Elvis’s parents and the night that Elvis was born. And then it was the great Waylon Jennings with the very entertaining NOBODY KNOWS. I absolutely adore BLACK VELVET by Allanah Myles and have played that before. But, hey, when a song’s as good as this one it deserves a replay! U2’s song ELVIS ATE AMERICA illustrates the many personas of Elvis, both good and bad. And then it was the romantically delusional Scouting For Girls with ELVIS ISN’T DEAD: “Elvis isn’t dead ’cause I heard him on the radio….. and you’re coming back to me.” Yeah, sure guys. John Fogarty likens Elvis to the BIG TRAIN (FROM MEMPHIS). Neil Young reminded us that it’s “better to burn out than to fade away “, with his song MY, MY, HEY HEY. Another of my faves followed: Cowboy Junkies with BLUE MOON REVISITED, otherwise known as SONG FOR ELVIS. And then it was Paul Simon’s song about travelling to Elvis Presley’s home, GRACELAND, with the Everly Brothers helping out on vocals. Don’t have a clip with the Everlys in it, but you can’t do much better than this concert performance of the song in Zimbabwe. Enjoy. Next week’s show will be dedicated to the patron saint of Theme Park, Roy Orbison, who died 21 years ago this December 6. So songs by Roy Orbison, The Travelling Wilburys, duets with Roy and covers of Roy Orbison songs. Anything connected to Roy Orbison qualifies. Personally I can’t wait!